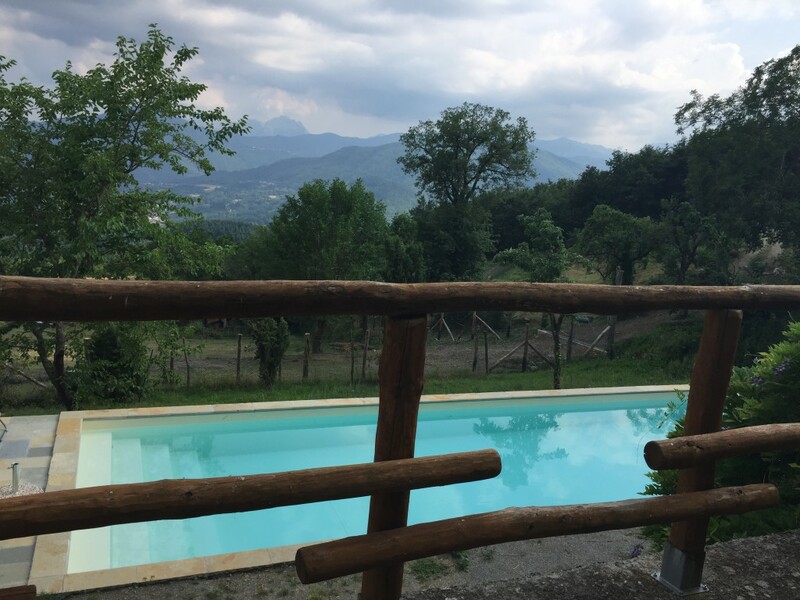 I invite you to spend a dream Five Star holiday at my beautiful northern Tuscan property known as ‘I Cinghiali’ or ‘The Wild Boars’ in the hills of the Garfagnana, a magical green oasis where the pace of life has changed little over the ages. No famous artworks, just wonderful villages full of local people going about their daily business in the marketplaces. No Michelin logos, but the most unbelievable food prepared by Slow Food chefs and the woman of the house where you enjoy the specialty of the day without the need for a printed menu. Yes, there are supermarkets, but the produce found in the small specialty shops reminds you how good food tasted when you were young. Cheese is made in the next village; the prosciutto in my village shop is the best on the planet and you can buy fresh and delicious unpasteurised milk from a vending machine in the town. Your fresh, tasty fruit and vegetables can be bought at the weekly market or from my neighbour Vittorio for a few Euros. Or, if you’re there at the right time, free from the veggie garden and small orchard on the property. Almost daily markets are held around the valley where you can forage for shoes or skirts or jumpers and pants…for a handful of Euros and the best men’s jeans in Italy at ridiculous prices and wonderful kitchen gadgets. Along with fresh fish and wild boar salamis and Gorgonzola that melts in your mouth and a whole lot more. Mouth watering bread comes from the bakery in the local town but get there early for the best foccacia you’ll ever taste. You will enjoy the stunning 12 meter pool built for your enjoyment in 2014 and floodlit for the evening. You can relax on the terrace and gaze at the 10th century fortress on the hill opposite with a glass or three of inexpensive wine in your hand, you can listen to my collection of CD’s or the natural sounds of the village and the local farmers or you can walk in the 10,000 hectare national park a few kilometers up the hill or explore the nearby quaint hilltop villages. 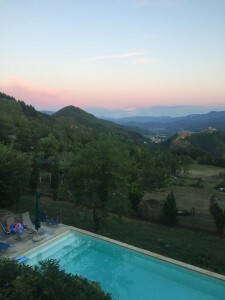 If you want a holiday out of the summer season you will love the changed pace of life and produce and as the villa is fully heated, it’s available all year. If you are there in autumn you will watch the chestnuts fall from the trees and then the leaves turning into different hues. You may be there for the grape harvest at my friend’s vineyard – now that’s a day not to be missed! In winter, or at Christmas, its nice to snuggle by the fire with a glass of red in your hand, a good book and a pot of soup bubbling on the stove. The important thing is to go. What you do when you get there is your business. You will have a 80+ page booklet written by me of the things you won’t want to miss. You will bask under the impressive marble mountains where Michelangelo carved the Pieta and David and a trip to the fashionable Versillian coast and the Cinque Terre is a mere drive away. 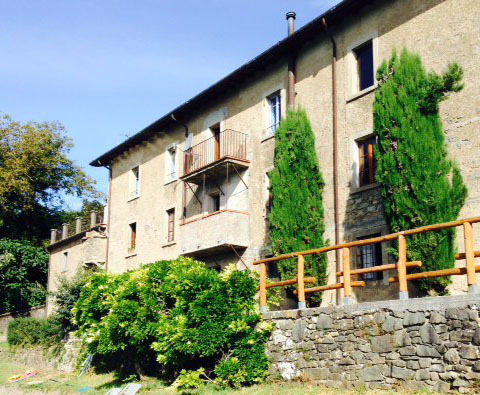 “I Cinghiali” has welcomed guests from around the world for 27 years, many have returned 4, 5 and 6 times. It is family owned and much loved. 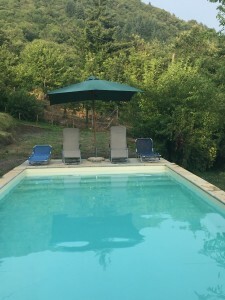 The property consists of a villa for 11 people and a studio for up to 4. 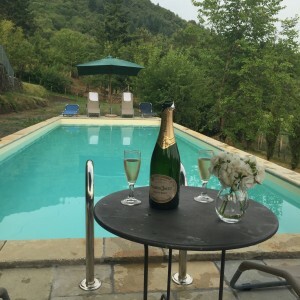 Former guests have written “If this isn’t heaven, you can see it from here”. The much admired and photographed view is of a 10th century fortress on the next hill. 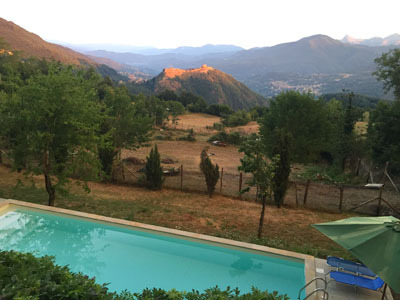 For a sojourn in my piece of heaven please submit your details for more information and you will receive a fabulous e-book on the Hill Towns of the Garfagnana, all of which you won’t want to miss! Please give me dates and I will respond with availability and price for your holiday. Dr Buzz McCarthy, owner since 1988.